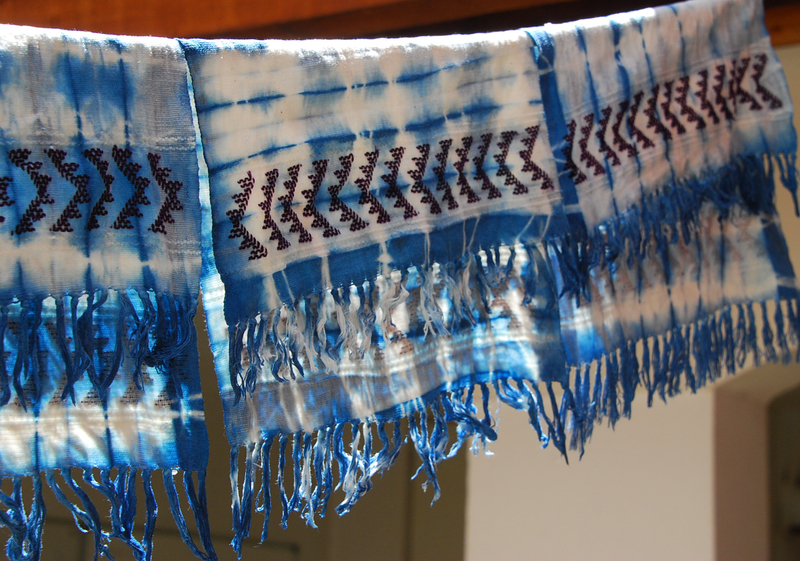 Actually, using resist dye technique using indigo to create patterns and designs on cotton is called shibori, tritik, amarra or plangi(depending upon country of origin). It’s not the hippie dippie 60’s tie dye that’s been reincarnated on beach blanket bingo T-shirts. It’s high fashion wearable art. Not long ago, I saw an Eileen Fisher designer label Made in Japan shibori design on a finely woven cotton scarf dyed with indigo at a Nordstrom selling for over $100USD. The technique is universal. 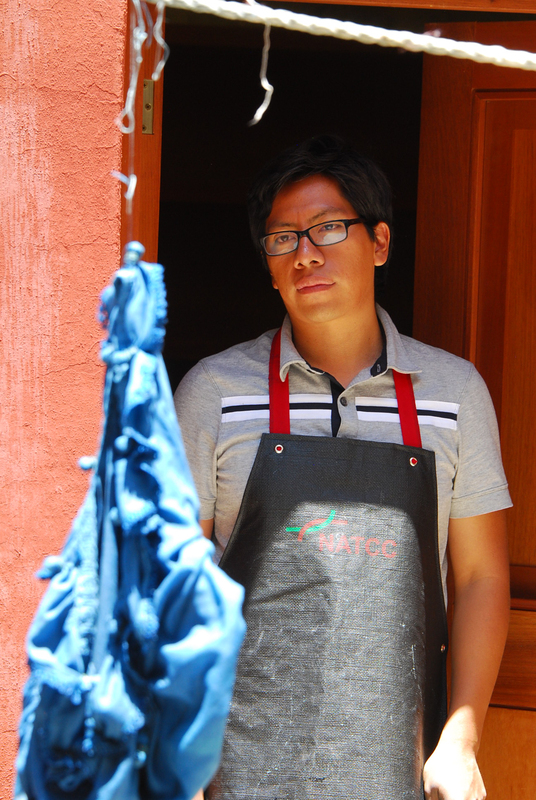 As frequently as once per month, Eric Chavez Santiago teaches a hands-on indigo dye workshop for people of all ages at the Museo Textil de Oaxaca. At a recent workshop, a mother, father and baby sister accompanied a six-year-old who made a fish design on a white cotton T-shirt. Dad was right by his side and the learning was a fun family adventure. Other participants included local artists, university design program students, and visiting tourists. 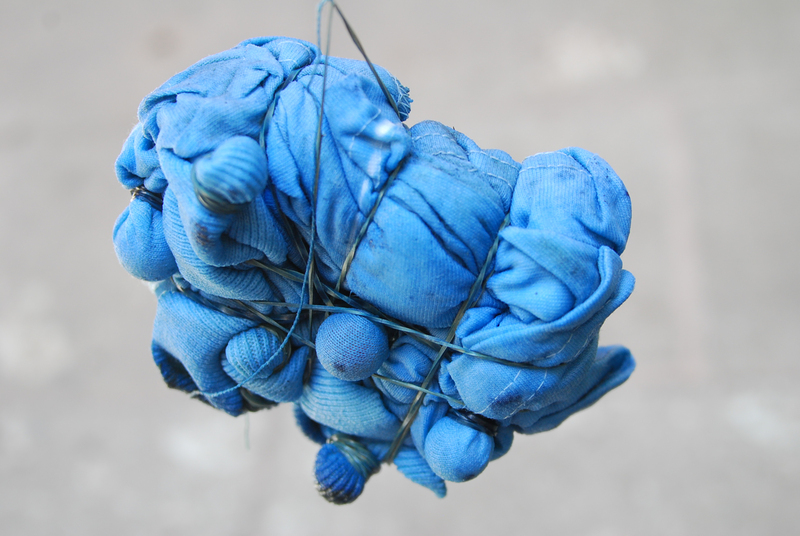 Indigo can be used to dye cotton, wool, alpaca, silk, linen and the fiber of the agave plant. 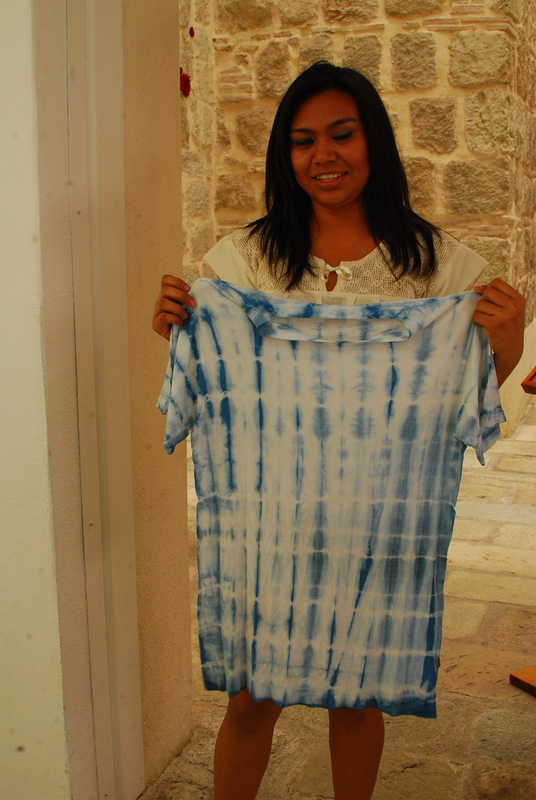 Some women in Oaxaca villages even use indigo to dye their hair. 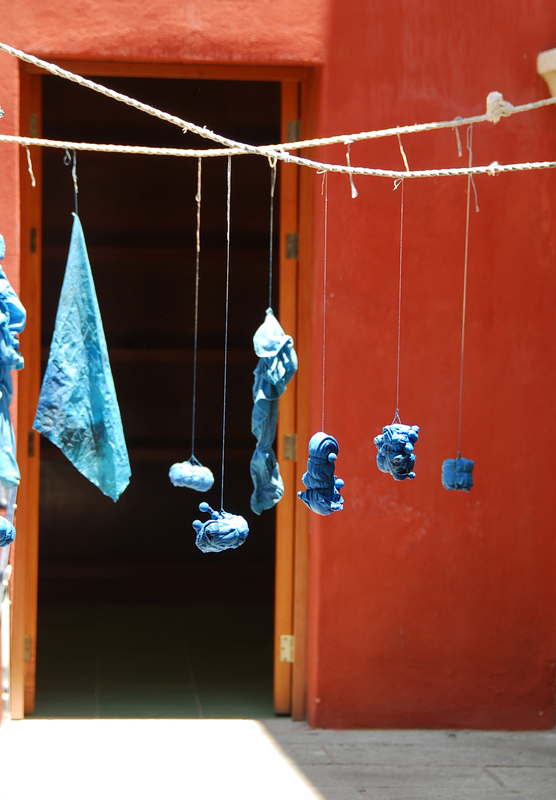 Dyeing with indigo is all about chemistry. Cellulose fibers such linen, cotton and agave absorb less indigo to get an intense color than do protein fibers of silk and wool. 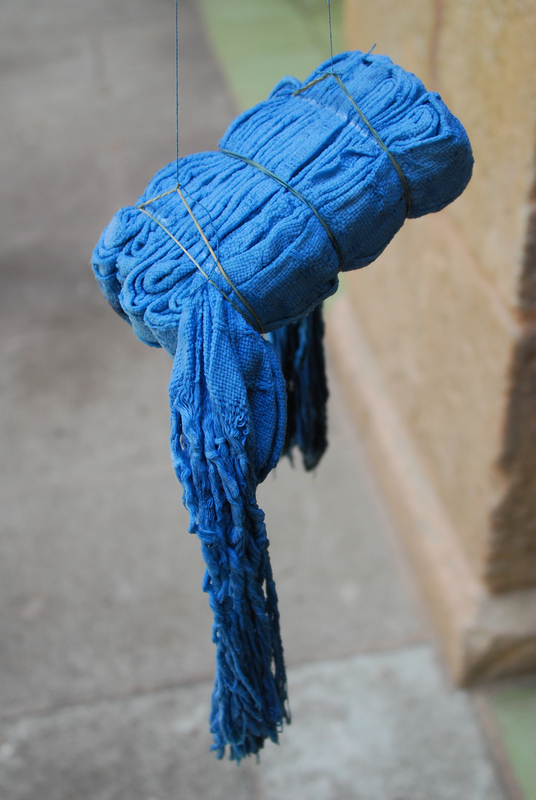 Said another way, it takes less indigo to dye cotton than wool. 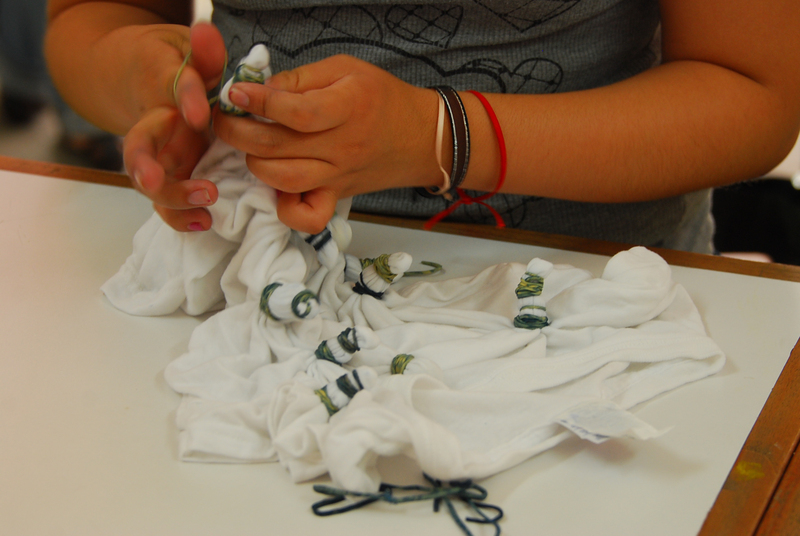 That’s why, we are using 100% cotton for the workshop. Polyester blends just won’t work because indigo saturates only the surface of the fiber, not it’s core. Look for Felted Fashion Oaxaca Style, coming in February 2013. It includes dyeing wool roving, silk, and cotton with natural materials and making your fabric into luxurious scarves, blouses, wraps. Contact me to get on the mailing list for complete course description. Instructors are clothing designer Jessica de Haas, Vancouver, B.C., and Eric Chavez Santiago, Oaxaca, Mexico. Limited to 8 participants. The process is fairly simple. First, we rinse the white fabric (I dyed white, handwoven cotton napkins from the Amuzgo tribe) in clear water to soften it. Then, we squeeze out all the moisture and make our design. 1. 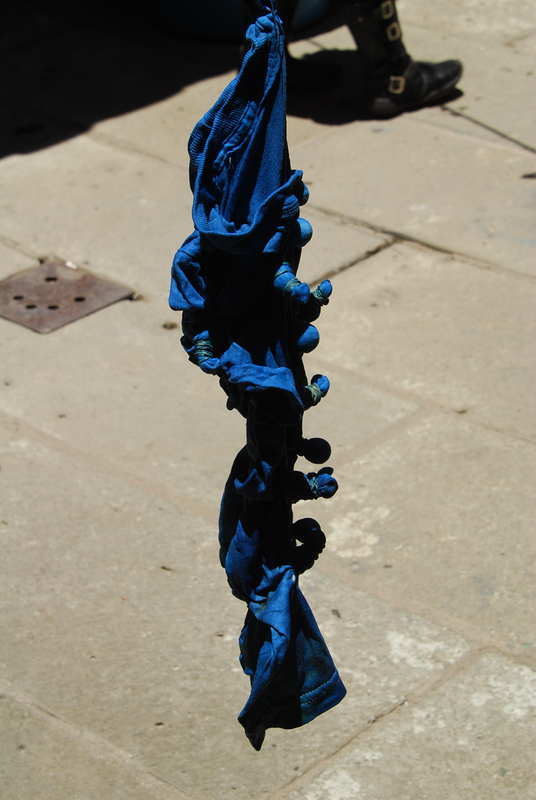 To make the shibori design, you can make accordian folds and then tie this together with rubber bands or with string. 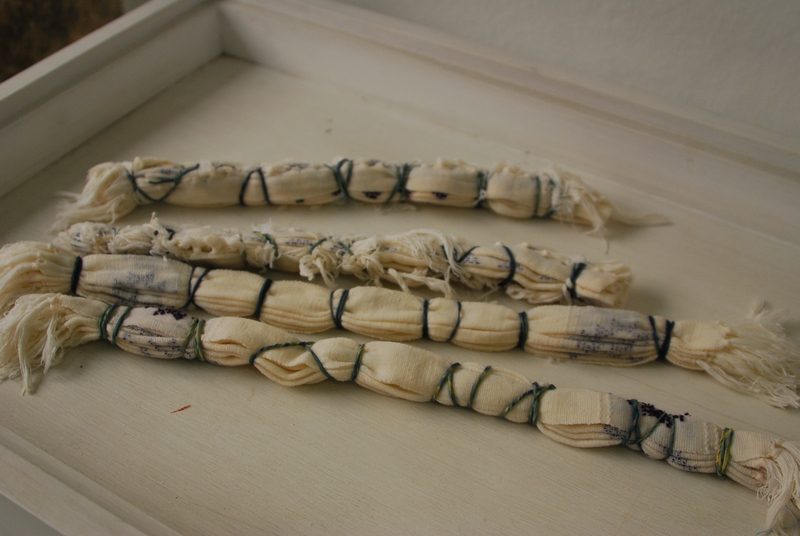 You can drape cloth over marbles or beans, securing them with string or a rubber band. You can whirl the fabric and then tie it with string or rubber bands. 2. To make the tritik design, you use a needle and thread to create a very specific pattern, folding the cloth and then sewing through it. 3. It probably takes about an hour to make the design. Tie a lead string onto your fabric so you can easily fish it out of the water. 4. Dip the folded and/or sewn fabric into the dye pot for 20 minutes. Be careful to immerse it gently into the solution. Do not stir or disturb in any way. Pull the piece out of the dye pot with the lead string. 5. Hang on a line from the string until the fabric changes from green-yellow to blue, for 15-20 minutes. 6. Repeat two more times. 7. Remove the rubber bands or thread. 9. Let hang to dry. 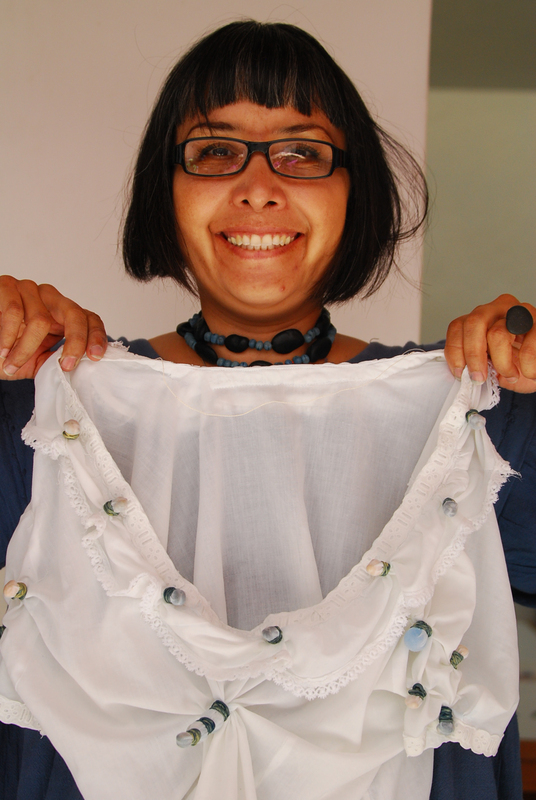 This entry was posted in Clothing Design, Cultural Commentary, Oaxaca Mexico art and culture, Workshops and Retreats and tagged art, blogsherpa, class, clothing, course, design, handmade, indigo, Mexico, Oaxaca, shibori, textiles, tritik, workshop. Bookmark the permalink. Along with giving indigo and cochinil dying workshops, can you also supply anil and cochinil on a regular basis. We are interested in taking the workshop but want to make sure we can get the ingredients for future use. 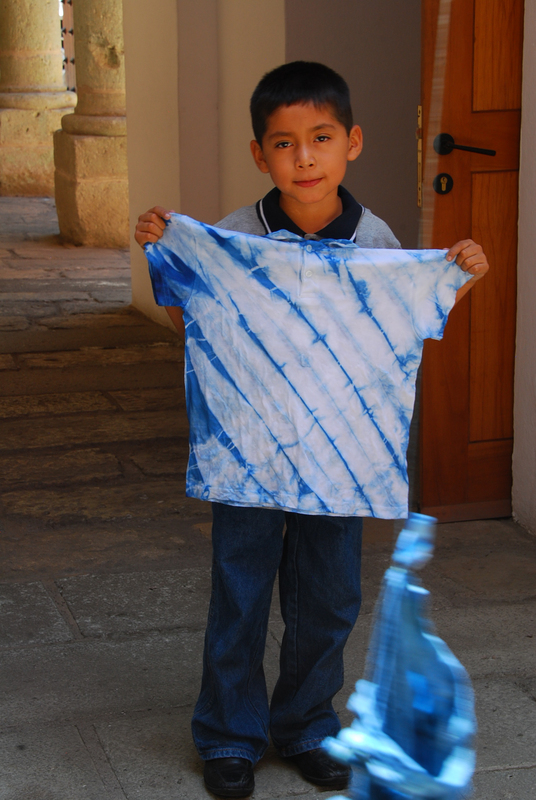 We can refer you to the Museo Textil de Oaxaca to source the dye materials and to the artisans who teach the workshops. You are welcome, Barbara. Thanks for reading. 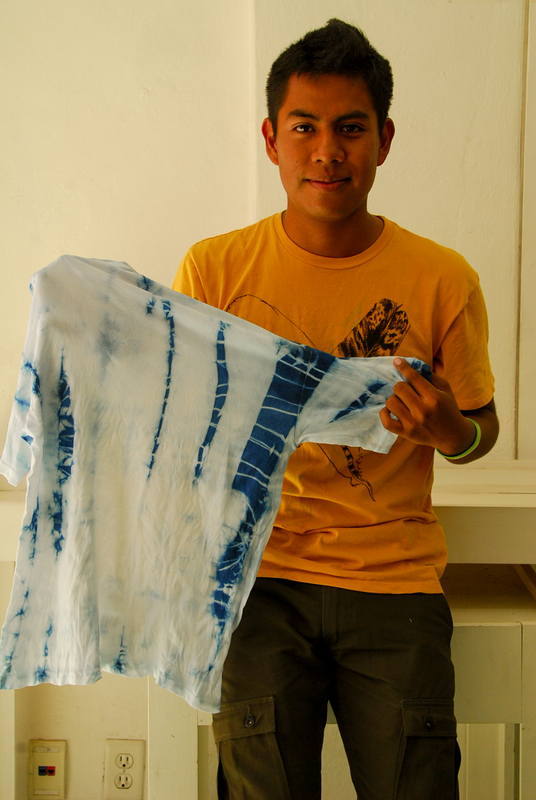 I AM INTERESTED IN HAVING CLASSES OF SHIBORI AND TIE DYE IN VANCOUVER. I CAN PAY IT ALONE. I am sorry, we do not offer these classes in Vancouver. Please contact MAIWA for classes there. I’ll be in California next week and I’m hoping to visit Eric and family for their talks about rug weaving and its place in Oaxacan culture and economy. Also hoping to take one of your workshops soon, and maybe Eric’s, as well. I’ve been back in Steamboat Springs for two weeks. Slow transition; don’t miss the sismo alarms! 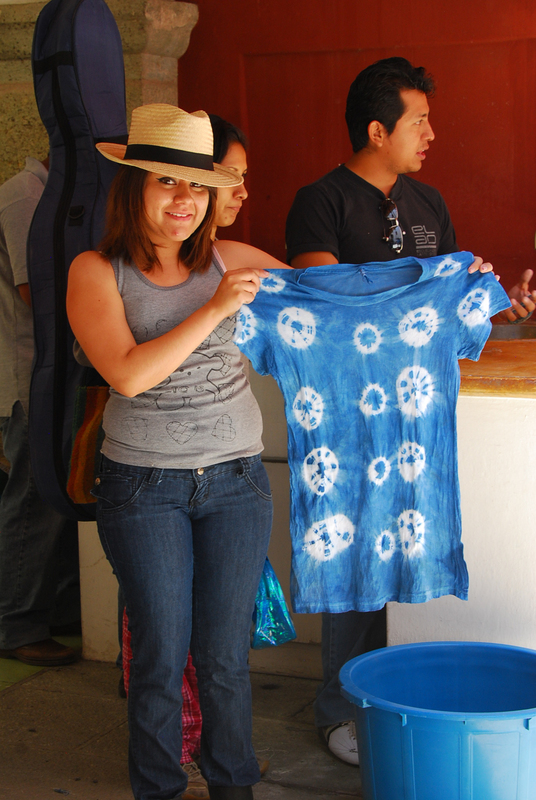 Please get me on the list for the felting class next FEB. Ojalá – I will be en Oaxaca again. Are you back in the states?